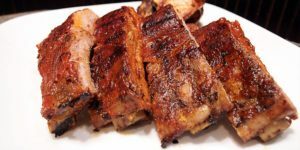 *This tastes best when the ribs are browned first in a small amount of vegetable oil, but you can also just dump it all in the Crock-Pot, and it will still be delicious. If browning the ribs, pat dry with paper towels and brown all sides on a heavy skillet with a small amount of oil. Drain well before adding to the pot. Peel and quarter the onion and place on the bottom of the pot. Mix the cider with the chipotle puree and salt, pour over the ribs and onion. Add the cloves, cinnamon stick and orange peel (stick the cloves in a part of the orange peel to make them easier to find, later). Set your Crock-Pot on high for 6 hours. Go take a nice little hike. Check after 4 hours to be sure there’s enough liquid. Add a bit of water or cider if it looks dry. When done, meat will be falling-off the bone tender, lightly sweet and as spicy as you like. You can serve it immediately on rice, slider buns, or wrapped in tortillas, or you can shred the meat with forks, cool, pack and freeze for incredibly easy, incredibly tasty and quick lunches and dinners loaded with fall flavor! Please Note: We respect your privacy and we will never sell, redistributed, or spam your inbox. Now you can suffer at home! My husband and I love to visit S. Molly's for all occasions. The atmosphere is great with understanding wait staff and fun decor. Also, the food is fabulous! Always fresh. They do not use fillers here. There are vegan and vegetarian options too! In addition to great food- their drinks are awesome! Their Caribbean themed drink menu has many margaritas ( blended or over ice) with Molly's signature flavors and other tasty drink creations too. In the summer, my friends and I love to share a pitcher of our favorite mixed drink on their large patio! Ate here 5 nights in a row and can't complain. Cool spot with good food. A little different than the norm. Tried several different meals and never disappointed. Had drinks a few nights. Staff is always super friendly. Food here is excellent and so is the atmosphere. Always enjoyable. Meet friends here often and always have a great time. Highly recommended for both food and good vibe. Street food from global hotspots, a great bar & happy people keep this casual, quirky neighborhood restaurant hoppin’ to a world beat for lunch and dinner 7 days a week. Have our world famous Great Balls of Fire and get your picture in our Hall of Flame! Receive discounts, specials, recipes, event invites, and other fun surprises every month! © 2017 Salvador Molly's Restaurant – Portland, OR . All Rights Reserved.